PRATT – We’ve all made New Year’s resolutions to lose weight, eat less, quit smoking or exercise more, and most of us find them hard to keep. However, what if there was a New Year’s resolution that was not only easy to keep but was enjoyable and fun, as well? Impossible, you say? Not if you resolve to participate in a First Day Hike at a Kansas state park. 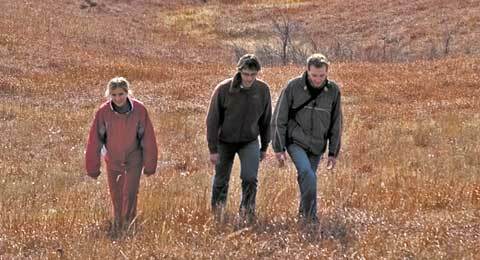 While the trails at Kansas state parks are open every day, many parks will host special events on Jan. 1, 2016, to promote the First Day Hike program. It’s a great way to spend quality time outdoors with family, exercise and burn off some holiday calories and enjoy an uncrowded state park experience. If participating in First Day Hike events, all hikers should wear warm clothing and good trail footwear and bring water, a camera and binoculars. Pets are welcome, but must be leashed at all times. Don’t forget your favorite animal identification guides. State parks in northeast Kansas offering First Day Hikes include Pomona State Park, Clinton State Park, Hillsdale State Park and Perry State Park. White Feather Campground. Meet at the Pomona State Park office at 1 p.m. Refreshments will be provided after the hike. Visit the Pomona State Park Facebook page or call the park office, 785-828-4933 for more information or cancellation notice. North Shores Trail. Meet at the Clinton State Park office at 1 p.m. The trail is moderate in difficulty and 2 miles long. Hikers must be at least five years old. For more information or cancellation notice, see Clinton State Park’s Facebook page or call the park office at 785-842-8562. Hidden Springs Nature Trail. Meet at the Hillsdale State Park office at 10 a.m. Contact the park office, 913-783-4507, for more information or cancellation notice. Mad Mile and Daisy Point trails. Meet at Perry State Park Biking/Hiking Trails on Kimberly Drive off West Lake Road at 10 a.m. Bring your own water and snacks. This is a mountain bike multi-use trail so the trail is dirt with tree roots and rocks on it. There are ravines. The entire trail is not wheelchair accessible. Call the park office, 785-246-3449, for more information and cancellation notice. Information and photo thanks to Kansas Department of Wildlife, Parks and Tourism.